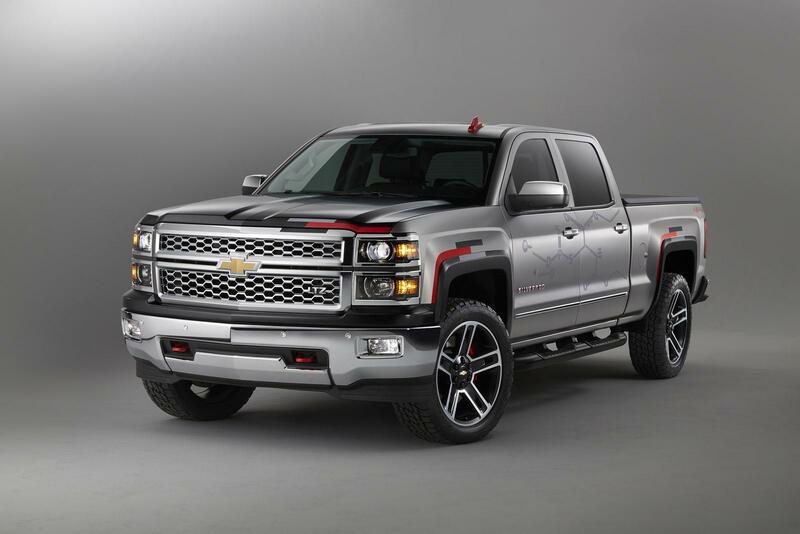 H Chevrolet στην SEMA τον Νοέμβριο θα παρουσιάσει το Silverado Toughnology Concept. Το πρωτότυπο είναι βαμμένο σε γκρι χρώμα, διαθέτει σκούρες γκρι και μαύρες λεπτομέρειες, διακοσμητικά γραφικά που δείχνουν την απεικονίσου του χημικού μορίου του χάλυβα στο πλάι, φιμέ παράθυρα, ζάντες 22″ και φουσκωμένα φτερά. Στο εσωτερικό υπάρχουν θερμαινόμενα καθίσματα, σύστημα ψυχαγωγίας πίσω καθισμάτων, επαγωγικός φορτιστής smartphone και το OnStar 4G LTE με Wi-Fi hotspot. Μηχανικά φορά τον V8 5,3-λίτρων κινητήρα που φορά σπορ εξάτμιση και ελεύθερη εισαγωγή αέρα, απόδοσης 355 ίππων με 519 Nm ροπής. DALLAS – High-strength steel makes the Chevrolet Silverado lighter, stronger and more efficient than the conventional carbon steel used in most vehicles. Those attributes are highlighted in the simulated raw steel appearance of the new Silverado Toughnology concept. The concept is also a showcase for Silverado’s connectivity technologies – including all-new OnStar 4G LTE with built-in Wi-Fi hotspot – as well as accessories and performance parts available through Chevrolet dealers. 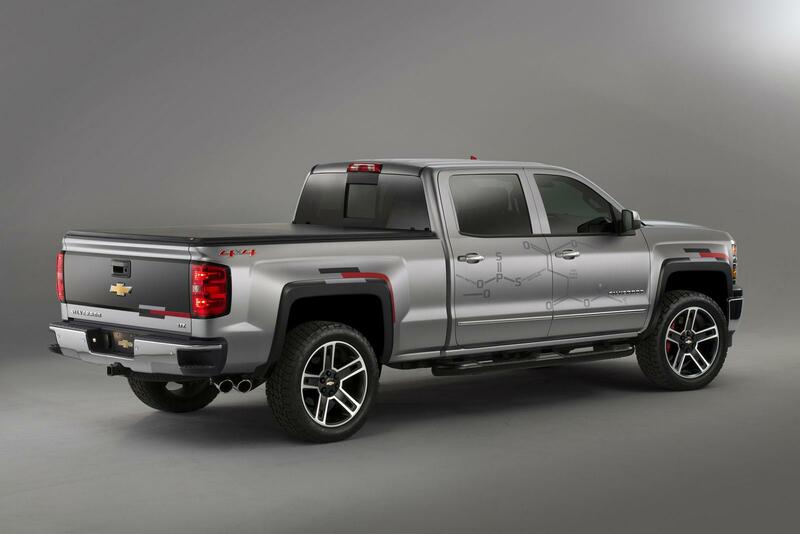 “The technology of advanced high-strength steel makes the Chevrolet Silverado stronger, lighter, more capable and more efficient – and that’s exactly what the Toughnology concept represents,” said Jeff Luke, executive chief engineer. “During the Silverado’s development, we evaluated all materials and chose those that would provide the best strength to support capability while still delivering a strong value to customers. High-strength steel, which is pressed while still in molten form, can be up to 30 percent lighter than carbon steel with the same strength. It offers significant mass savings at a lower cost than aluminum, which helps keep down the overall vehicle cost. Lower weight translates to greater efficiency and capability for truck owners. The 2015 Silverado 1500 with the EcotTec3 5.3L V-8 engine is EPA-estimated at 23 mpg on the highway and offers a maximum trailering capacity of 11,200 pounds, per newly adopted SAE J2807 Recommended Practices. With the available 6.2L V-8 engine and all-new eight-speed automatic transmission, the Silverado’s trailering capacity increases to 12,000 pounds. The Silverado Toughnology concept wears most of its high-strength steel under the skin, just like every production model. Approximately 67 percent of each Silverado cab is constructed of the durable material, including stronger ultra-high-strength steel. It is used in the A-pillars, B-pillars, rockers and roof rails, as well strategic sections on the interior structure. Ultra-high-strength steel is used in areas of the rocker panels and underbody to help improve performance in crashes. The 2015 Silverado 1500 crew cab model earned a 5-Star Safety Rating – the highest rating – in government crash testing. Lightweight strength extends to the Silverado’s pickup box, where the floor is made of roll-formed steel. It’s more durable than the conventional stamped steel used by other manufacturers and it’s lighter than the material used for stamped parts, further reducing vehicle weight. The Silverado also strategically uses aluminum, including the hood, which saves 17 pounds over a conventional stamped steel hood. The Toughnology concept is striking for its stripped-down appearance. The paint job mimics the look of raw, unpainted steel and is accented with steel molecule graphics. The hood – the only visible metal exterior component that isn’t steel – is painted black. Chevrolet Accessories grille insert Tubular assist steps Soft, folding tonneau cover Washable carpet bedliner Fender flares Tinted headlamp lenses. Performance capability upgrades include a performance exhaust system and upgraded performance brakes. Under the hood is a performance air intake system on its 5.3L engine rated at 355 horsepower and 383 lb-ft of torque. Inside, the Silverado Toughnology wears LTZ trim, including heated, leather-appointed bucket seats. It also features the available rear-seat entertainment system and Silverado’s latest connectivity features, including OnStar 4G LTE with built-in Wi-Fi hotspot and a wireless phone-charging mat that recharges phones via a magnetic inductive charge. The available OnStar with 4G LTE and built-in Wi-Fi hotspot provides a mobile hub for drivers and passengers to stay connected. The hotspot is on whenever the vehicle is on and comes with a three-month/three-gigabyte data trial (whichever comes first). 4G LTE is the most current and fastest mobile data network – 10 times faster than 3G and 100 times faster than OnStar’s previous generation hardware.